This beautiful old window has outlived the original frame, and has been rehoused in a substantial pine frame for display purposes. Removed from a house in Lancashire,during refurbishement. A window of outstanding beauty with exceptional coloured glass. 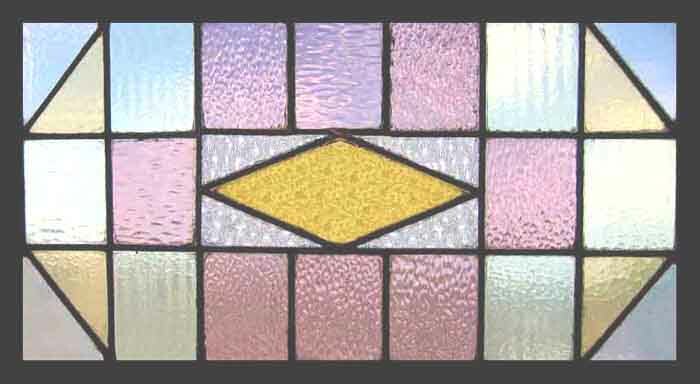 This coloured glass is of a heavy and deep texture. BEAUTIFUL SHADES OF GOLD , PALE LAVENDER, PALE GREEN. The leads & Glass are in sound condition. The frame measures 33 1/2 W" x 19 H" . The glass measures 30 3/4 " x 16 1/4 " .